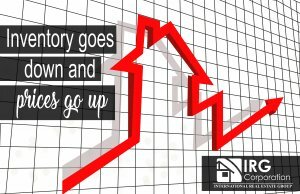 Because of how things have been moving continuously within the real estate market, the projections have stopped surprising showing continuous trends in which the inventory of listed properties falls and the price of the few houses that there are rising without appearing to have any type of top being this negative for all those first-time buyer. The months go by and the numbers reflect that there have not been too many changes, this is reflected in the decrease of opportunities for future buyers who are looking for properties and as a result, this represents a considerable reduction that if not faced properly could worsen with the passage of time. The most advisable thing is patience whether you are a buyer or an agent or a seller, because only if you manage things intelligently can you overcome any obstacle that the current situation may present being demonstrated by the fact that even the market is maintained at float even if the process has begun to slow down. The main consequence of the aforementioned is that those involved in the negotiations will see how the whole process becomes slower, how the searches that take place take more time and how the analysis becomes more complicated, since the values ​​that are reflected In the lists many times they will not be in accordance with the current reality of the property that is being viewed. The problems that are being seen now are the result of an accumulation of circumstances such as the fact that wages are maintained while rents rise leaving behind what a person can earn or also how the owners avoid selling their properties because of the fear that there are no other options when trying to replace what you no longer have. Optimism will be seen in the moment that current trends begin to change projecting necessary changes so that much more inventory appears and thus supply and demand are benefited to such an extent that the numbers are positive for everyone who is involved in the Real estate today.